On Oct. 20, the Lakers and the Houston Rockets were in the tail end of a game with the score sitting at 109 to 108, with the Rockets on top. The tension was very high considering the game was super tight with four minutes left on the clock. Then, James Harden decided to drive in and got fouled by Brandon Ingram. Ingram appeared to be calm, but as he walked back to his team, he shoved Harden. That’s what started it all. As the Lakers scrambled to hold Ingram back, Lonzo Ball managed to get Ingram away from all the trouble. However, on the other side, Chris Paul and Rajon Rondo were in each other’s faces when Chris Paul shoved his finger into Rondo’s eye. Clearly upset, Rondo gave Paul a push and then connected with a left jab to the head. They both continued to throw punches as they were separated by teammates. 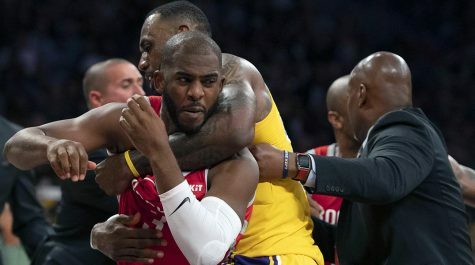 At the end of it all, Chris Paul claimed that Rondo spit on him, but in the film there was no sign of this. Either way, I don’t think Paul should have shoved his finger in Rondo’s face because he knows that’s only going to make the situation worse. In the end, Ingram, Paul, and Rondo were all ejected from the game and received suspensions. Eventually, the Rockets won the game.